War covers the southern islands until it fi nally reaches the idyllic isle of Feshyr. You take on the role as the new nameless hero after your village has been pillaged and destroyed by paladins of the king. Seeking revenge, you soon realize that this cowardly attack did not just happen on a reckless mercenary`s whim. 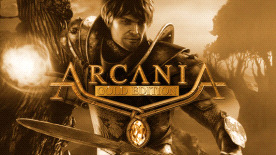 ArcaniA – Fall of Setarrif is the first stand-alone expansion for ArcaniA, further enriching the storyline.